About ten years ago, we decided we wanted to see more of the world. For some reason, we decided that sailing would be the best way to accomplish that. I’ve done some sailing with my parents on a local lake so I already know pretty much everything I need to know to sail the worlds oceans right? And Sonni is from Wyoming so she clearly knows everything about living on the ocean. So we hatched the plan. 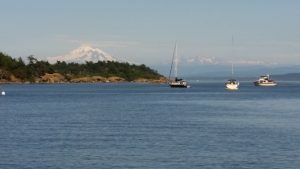 We took off for the Puget Sound and took a week long sailing class. Even though we were cramming information into our brains faster than they would absorb, we instantly fell in love with the water, and the ability to move around on it with the power of the wind. We were going to travel the world on a boat someday. Fast forward about six years, we were sitting in the St. Joe River with a cold boat drink reading books from Captain Fatty and Lin and Larry Pardey. It was time. We decided to downsize and start working on getting that boat. We sold our house on acreage, which we loved but wasn’t helping us save money. We took ten loads of stuff we’d collected over the years to the Salvation Army, and what they didn’t want went to the dump. We had A LOT of stuff. And it wasn’t going to fit on a boat. We moved into the basement of a vet clinic free of rent for a couple years to save money. Friends and relatives had reactions including “You’re crazy, you know there are pirates out there!”, “You have no idea what you’re doing!”, “Nice idea, but you’ll never pull it off”. And they’re all correct… so far. We spent countless hours on Yachtworld.com looking at boats. We attended a cruising seminar from Mahina Expeditions in Seattle. We read everything we could get our hands on to learn about what we needed to do to pull it off. We looked at hundreds of boats and when we were about to give up, we found her. 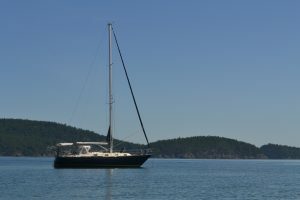 A 1980 Tartan 37 sitting in Sidney, British Columbia. Not too big, not too small, not too expensive, but very well maintained and upgraded. She had a new mast and sails, new paint job and shiny new stainless portlights gleaming in the sun to draw in the unsuspecting first time buyer. It worked. We put on 900 miles over the next 7 days driving between Spokane, Sidney and Anacortes, and that didn’t include ferry crossings. On the Friday before Memorial Day we signed the papers and took delivery in Friday Harbor. 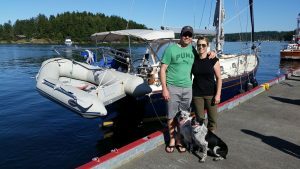 So we have the boat, we’ve saved up the money, and we spent the summer cruising the San Juan Islands. We now know a little more about sailing. We found out there’s a whole lot more to learn (and buy), but we’ve made the first big step. The final planning can start. 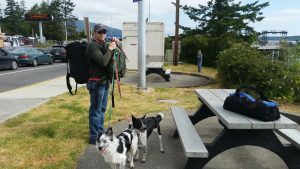 Waiting for the ferry in Anacortes. Anchored in Spencer Spit State Park. Mt. Baker from Sucia Island. Wow! You’ve got to have a dream before it can come true! Next comes a lot of determination from a very smart couple. You’re off and running (sailing)!